The media double standard reflects the double standard of some of the more vocal protest groups. Forbes posted an article on Tuesday that beautifully reflects this double standard. 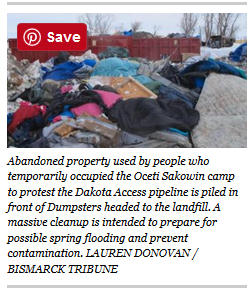 The article deals with the environmental threat posed by the protesters at the site of the future Dakota Access Pipeline. The threat is not a perceived future threat, such as is claimed by the protesters if the pipeline were to rupture, but an actual threat that must be dealt with before the spring thaw. I strongly suggest that you follow the above link and read the entire article–it is done almost as a parody of The Twilight Zone. There is of course no national media uproar condemning the protesters who have created the current mess, or the conflict groups that helped to organize them, raised millions as a result of the conflict, but are contributing nothing to the cleanup. Nor is there any negative media mention of the dozens of celebrities who have visited the site to get a little free publicity over the last several months, or drawn attention to themselves by supporting the cause on social media, but who also are doing nothing to help with the clean up effort. The Washington Post managed to find space to publish a story on the situation on Monday, but its story angle was completely sympathetic to the protesters – whose efforts have now cost Morton County taxpayers almost $33 million at last count, with millions more to come – and to the Standing Rock Sioux Tribe, whose national call to action last summer was the catalyst for the influx of the outside protesters. Indeed, a January tally of the almost 600 protesters who have been arrested during this protest action demonstrated that more than 94% of them hail from out of state, and more than 180 had criminal records. The state of North Dakota also manages a website – NDRESPONSE – that provides excellent documentation of the real status of the protest site. Their reporting has very clearly demonstrated that there is far more “in the slurry running through the camp” than the Post’s report implies, and with another week of spring-like weather to come, concerns about the potential for that slurry turning into a stream carrying pollutants into the nearby lake are very real indeed. “We are very concerned about the potential for significant flooding and runoff into the lake later this week,” Keller said. The pipeline poses a minimal potential threat. The protesters have created an environmental disaster. If the state of North Dakota cannot clean up the mess before the spring thaw, the local residents will not have safe water to drink. The protesters have done immediate damage. The pipeline is engineered to be safer than alternative methods of transporting oil. Hot Air posted an article today about the draft report on hydraulic fracturing (fracking) done by the Environmental Protection Agency (EPA). The report has been five years in the making. There is, however, a problem with the report (according to the EPA). The research did not give them the answer they wanted. I suspect what will happen next is that the EPA will spend billions of dollars of tax payer money until they can somehow come up with a report that gives them the answer they want. It’s always fun to try to prove a negative. America needs to be energy independent, both for economic and security reasons. The EPA is not helping American achieve that goal. None of us want dirty water or dirty air, but all of us do want to be free and safe. Any economic growth during the Obama Administration has come from American energy production. Now the Administration is trying to curtail that production. The Washington Examiner is reporting today that the Obama Administration has released the first federal rules governing hydraulic fracturing, or fracking, on Friday, setting new standards across the 750 million acres containing federal minerals for the drilling method that has unlocked a domestic oil and gas boom. Note that the Obama Administration has released these rules–they did not come out of Congress. That is the first problem. Who is writing laws in America? What does the U.S. Constitution have to say about this? For oil and gas companies, the Interior Department rule is another kick while industry is down. Low oil and natural gas prices — caused partly by the success of fracking, which has turned the United States into the world’s top oil and gas producer — have crimped budgets, prompting companies to lay off hundreds of workers. On top of that, the rule comes as the Interior Department is looking at regulations to reduce “venting” and “flaring” of excess natural gas produced at wells on federal lands. We need to understand that it is necessary for America to be energy independent. We also need to understand that there are a lot of very wealthy people who do not want America to be energy independent. Many of those wealthy people make large donations to Congressmen and Senators. We need to remove the Congressmen and Senators who are blocking American energy independence from office the first time they are up for re-election. Energy independence might introduce some sanity into American foreign policy (note that I did say might). Lawmakers on either side of the issue are wasting little time to fight the proposal. Sen. Jim Inhofe, R-Okla., introduced legislation Friday with 26 other Republican senators as co-sponsors that would give states, rather than the federal government, primacy over regulating fracking on federal lands within their borders. “We have long supported a states-first approach to hydraulic fracturing, recognizing that states have a successful record of effectively regulating hydraulic fracturing with good environmental stewardship. Now, however, the Interior Department is imposing a federal regulation that duplicates what the states have been doing successfully for decades,” said bill co-sponsor Sen. John Hoeven, R-N.D. In the House, Democrats introduced five bills Thursday designed to restrain fracking. Environmental groups cheered the effort, dubbed the ‘Frack Pack,’ which they said would increase transparency and close loopholes such as the exemption for most fracking activity under federal Safe Drinking Water Act.